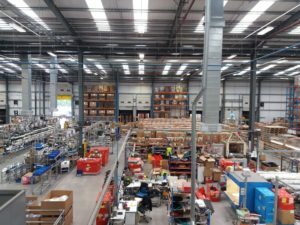 Heating, ventilation and cooling play a crucial role in the working environment for most buildings and especially within a manufacturing facility. 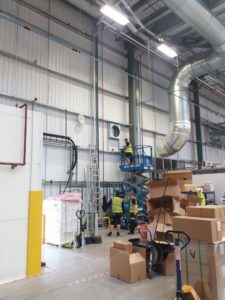 EcoCooling’s application engineering department offered its years of evaporative cooling experience to work with installers SMARTech energy on the design and installation of an energy efficient cooling system at the 170,000 sq.ft site, known as PortalMill. Nine ECP EcoCooler Small units were installed for the manufacturing space – enabling control of the air temperature and humidity levels in the assembly and manufacturing machine areas; acting as a recirculation system for winter and a ventilator or evaporative cooling system for the summer. The external units are roof mounted so require no floor or external space for installation. All work can be carried out during business hours and does not require any downtime. The cooling solution will improve the working environment for its staff and deliver energy savings to the company. Even on the very hottest summer days the EcoCoolers will supply fresh air cooling at temperatures below 23C at typically less than 10% of the operating costs of refrigeration. 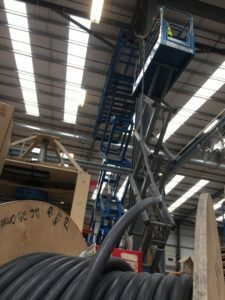 EcoCooling approved installers SMARTech energy’s team took five weeks to finalise the project – which included laying more than seven miles of cable throughout the facility. MD of SMARTech energy, Stuart Pearce said “Evaporative cooling is a completely natural way of producing refreshing cool air and only runs at 10% of the running cost of air conditioning. The costs to cool and maintain a system over this area is expected to run at £3.15 per hour for supply and extraction”. SMARTech energy MD, Stuart Pearce continues “Government legislations and the pressure of corporate social responsibility on industrial sites, means energy efficient technologies such as evaporative cooling and LED lighting, to name a couple of examples, has never been so important in terms of both carbon reduction and the energy savings made”. 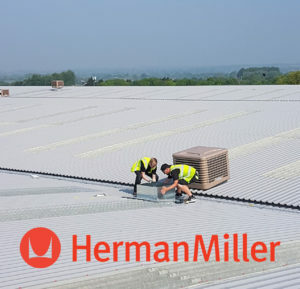 Martin Waller Head of Engineering & Quality – EMEA at Herman Miller commented “The major benefit of this new ventilation is the improvement in the working environment for the operations team, due to the zonal control of ventilation and cooling. In addition, there will be a reduction in electricity consumption”.